“ Param Dharm ” appeared in the Brahm Muhurt (morning dawn) on the first Thursday of spring season in the year 2007. Then it was written by Param Pujya Krishna Mohan Shankar Yogi Aadhyatmik Neta in the state of ecstasy (purn samadhi). It is in the form of a divine Granth.“Param Dharm” is the origin of Dharm. “ Param Dharm ” is that innate form of Dharm which people have forgotten. Today if the worst condition of the earth is not controlled soon, the life on earth will be vanished. In these difficult conditions, “Param Dharm” is the best direction given by the God. The solution of problem of hunger & thirst of all living beings is vested in “Param Dharm”. Life is full of pleasure and happiness. “Param Dharm” gives us the direction for living a prosperous life. “Param Dharm” makes the way for living of standard and life of standard together. 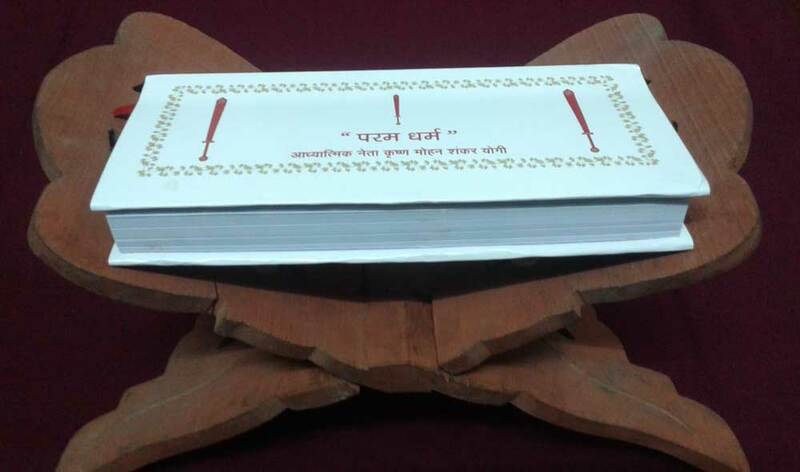 By this time, “ Param dharm ” granth (book) is available only in hindi language. Soon it will be published in engish also. If you want to purchase " Param Dharm " granth now in hindi, you can buy it directly from our site. If you buy it directly from our site, the granth will be delivered within 5 - 10 working days (for delivery locations anywhere in India). Note - if the delivery location is anywhere in India, no delivery charges will be added to this price. Give all possible support in the dissemination of “Param Dharm”. Only generous people can accept “Param Dharm”. Only a real warrior will accept “Param Dharm”. Only a truthful person will accept “Param Dharm”. Only a brave person will accept “Param Dharm”. Only a diligent person will accept “Param Dharm”. Only a learned will accept “Param Dharm”. Only a philanthropist will accept “Param Dharm”. “Param Dharm” is the only mean for the fulfillment of all good wishes in the kaliyug period. “Param Dharm” will bring the heaven on earth. “Param Dharm” will lead to the golden age. “Param Dharm” will turn the human into humane. Vacation will be only on Thursday. After the complete dissemination of “Param Dharm” in the whole world, there will be an excellent period of thousand years. The only “Param Dharm” will bring about all the delights in your life. The only “Param Dharm” is capable in destroying all the adversities of your life. In the kaliyug, only “Param Dharm” is the giver of all the auspicious results and all the virtuous fruits. The only “Param Dharm” is going to get you rid of all your troubles. The only “Param Dharm” is going to remove all your miseries. The only “Param Dharm” is the cause of your good luck. The only “Param Dharm” is the enhancer of your fortuity. The only “Param Dharm” has brought the windfall for the Earth. The only “Param Dharm” is the fortune of the Earth. Accepting the “Param Dharm” is your only destiny. The only “Param Dharm” is the reward for your prayers and austerity. The only “Param Dharm” is the blessing for you. The only “Param Dharm” will solve all your problems.